ANZ-Roy Morgan Consumer Confidence fell 3.6% to 107.0 in the week ending July 12, following a 4.6% fall in the previous week. This more than reverses the positive reaction to the May rate cut and Commonwealth Budget in just two weeks. 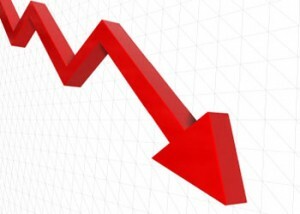 Confidence is now at the lowest level in twelve months. The volatility in the Chinese stock market and continuing Greek debt negotiations have driven confidence lower last week. This was reflected in the sub-indices on the economic outlook, which both fell around 8%. The sub-index on ‘economic conditions in next five years’ reached the lowest level since the weekly series began in October 2008. Households’ view toward their own finances compared to a year ago was the only sub-index to rise, however there was only a slight improvement (+0.9%). 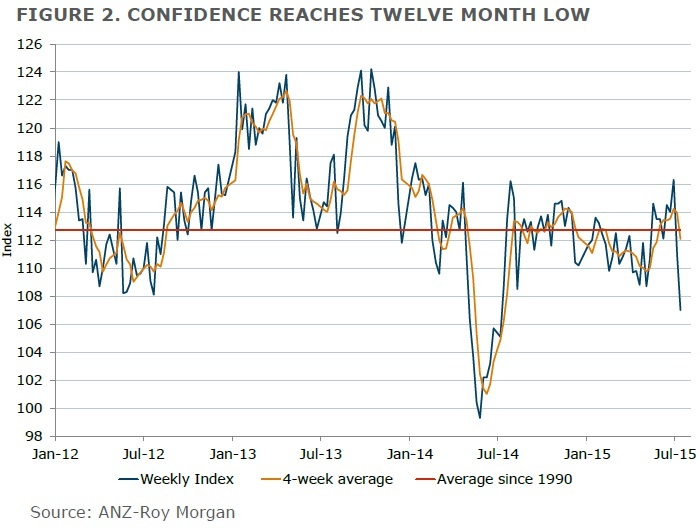 ANZ-Roy Morgan Consumer Confidence has plunged a sharp 8% in the past two weeks, reaching a twelve month low. This follows an eight month high just three weeks ago. The rapid turnaround in sentiment highlights the sensitivity of consumers towards both domestic and global conditions. Chinese stock market volatility and current negotiations surrounding Greece have dominated the news-flow over the past two weeks and spilled over into the local share market.